A new Microsoft Edge extension is now available to connect Insiders through notifications on new builds, features, fixes, and more. Ahead of its arrival as a Chromium-based browser, Microsoft Edge is seeking to connect more with Insiders. Microsoft has rolled out a Microsoft Edge Insider program extension. As you might expect, the add-on allows Insiders to see the latest features, fixes, known issues, news, and announcements. Microsoft says the extension is available for Canary (Chromium preview), developer, and beta branches of Microsoft Edge. Users can find the browser tool by heading to the Microsoft Store and selecting “Get”. Once downloaded, an icon appears in the Microsoft Edge toolbar that connects to notifications about Edge Insider information. 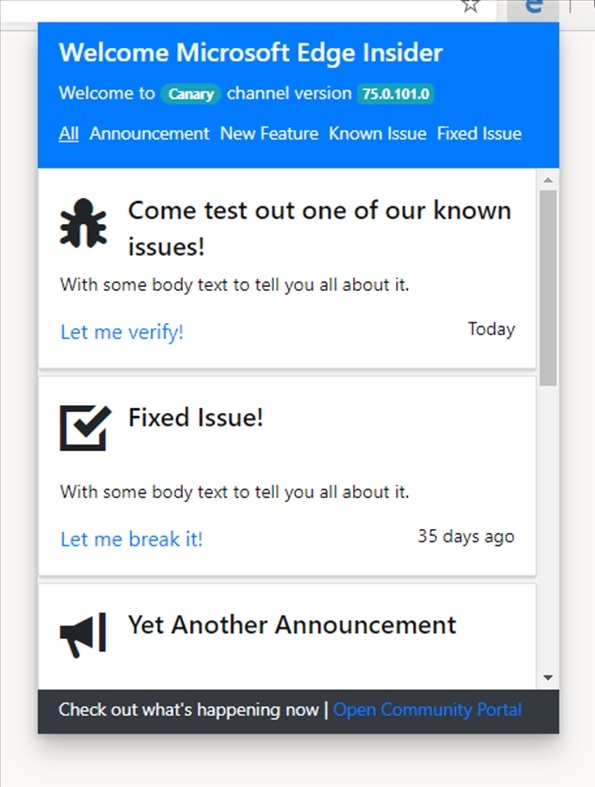 The extensions also send notifications about important announcements or problems. At the moment, the Edge extension is not showing any details about Microsoft’s Chromium-based Edge. Back in December, Microsoft announced it will abandon its EdgeHTML web rendering technology and move its Edge browser to Google’s Chromium technology. The idea is to give Edge more access to apps through web apps to better compete with Chrome. Microsoft has yet to officially announce the preview, so its absence on the extension is understandable. We expect the company to roll out the preview alongside Windows 10 April 2019 Update next month. When that happens, we guess information regarding the build will show up in the Edge extension. Earlier today, we reported on the full Chromium-based Edge leaking online. As Chromium Edge is still in early preview, there are some features missing. You won’t be getting a fully-fledged browsing experience here. Expect Microsoft to add features over time.